And if he left off dreaming about you, where do you suppose you'd be? Alice tried to catch her breath. She had been running for so long she almost forgot what she was running from. Her legs hurt and her toes were bleeding, but Alice couldn’t stop running. Not now that she was so close to the edge of that damned forest. Alice couldn’t help but crying. Her tears felt real, realler than ever, but her dream started to feel like someone else’s. Maybe they were right. REM had taken control over the Looking-Glass with extreme violence. The Red King could be an ever-sleeping capo, but his lieutenants and hitmen were always awake taking care of his business. Everyone was a sort of thing in His dream. The Red King owned everything and everyone. Including Alice. The couple of fat hitmen had stopped Alice in her way out of the forest. They were nasty men who smelt like sweat and cheap liquor. 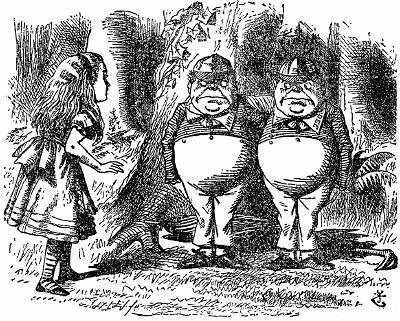 Dee and Dum, as they called themselves, took Alice by the arms and threatened her. She ran from them. But mostly she ran from her dream because it was her dream, wasn’t it? She was dreaming all that nonsense about the violent cartel that was controlling each and every movement in the Looking-Glass. Of course it was her dream and not some crazy drug lord’s who spend the day sleeping, dreaming about her, about everything. Rex Ex Machina, as everybody knew later, tortured and beheaded many of the high profile White King’s court men and advisors. Whoever questioned being part of the Red King’s dream were executed. 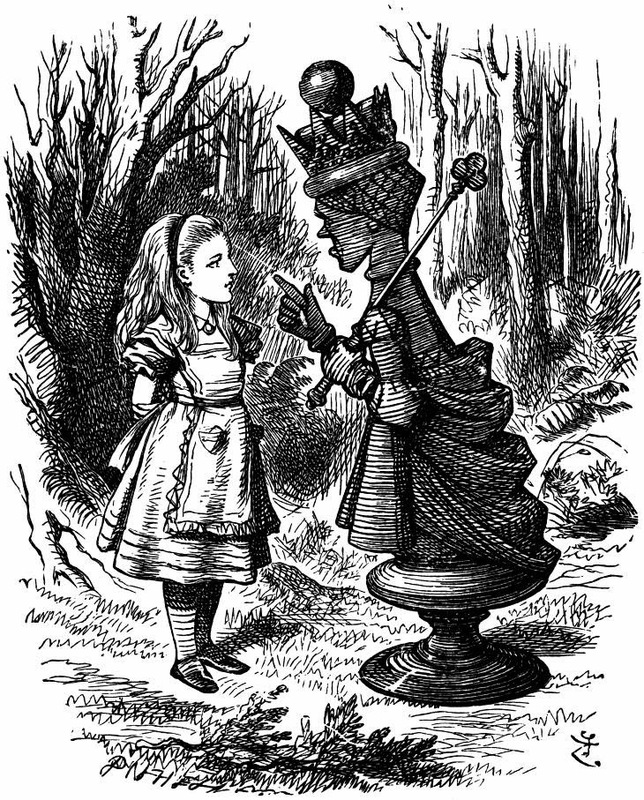 Then, Alice arrived to the Looking-Glass. She halted. A sound like a roar, like an engine, was rapidly approaching her. How could it be? The Red Queen came galumphing on a bandersnatch. Not far, a weird engine-like device carried the sleeping body of the Red King: the king from the machine. Alice remained silent. She had heard dreadful stories about the Queen’s cold and calm way to torture people. But, had she? Wasn’t this a dream? Her dream? “Hush! You don’t want to wake Him up, do you, dear child?” Said the Red Queen. Her voice trembling, waiting for the worst. “Wake the hell up, Alice!” She screamed her lungs out wishing for it to be HER dream. Everything goes out —bang! —just like a candle!